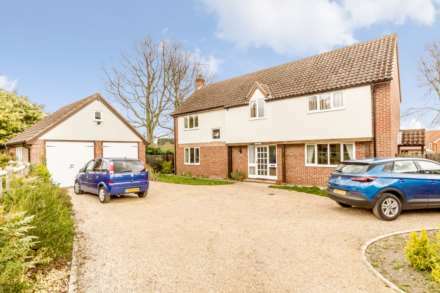 Offering ideal family accommodation and situated in the popular Norfolk village of Sporle, Longsons are delighted to bring to the market this well presented, spacious, four bedroom detached house. 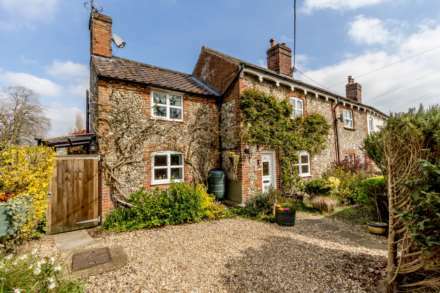 The property boasts three reception rooms, impressive fireplace with multifuel burning stove, en-suite shower room, integral garage with utility area to the rear, gardens, open countryside outlook to the rear and parking for several vehicle`s. Briefly, the property comprises entrance hall, sitting room, dining room, garden room, kitchen, cloakroom with WC, four bedrooms, en-suite shower room to bedroom one, bathroom, integral garage with utility area, gardens, parking for several vehicles, UPVC double glazing and oil central heating. UPVC double glazed entrance door to front, obscure glass UPVC double glazed window to side, two built-in storage cupboards, understairs storage cupboard, stairs to first floor, tiles to floor, radiator. Impressive, inglenook style fireplace with oak mantle, stone hearth and inset multi fuel burning stove, double doors opening to dining room, opening through to garden room. UPVC double glazed windows to rear and side. UPVC double glazed French doors opening to rear garden, rooflight, tiles to floor, wall lights. Sliding patio doors opening to rear garden, range of wall and floor mounted fitted cabinets and display cabinets, double doors opening to lounge, tiles to floor. Wash basin set within fitted cabinet, WC, tiled splashback, heated towel rail, tiles to floor, obscure glass UPVC double glazed window to front. Up and over main door to front, electric light and power. Utility area to rear of garage with worksurface, space and plumbing for washing machine, space for tumble dryer. Built-in cupboard housing hot water cylinder, loft access with loft ladder, UPVC double glazed window to front, radiator. Fitted wardrobes, fitted drawer unit, UPVC double glazed window to front, radiator, door to en-suite shower room. Shower cubicle with rainforest shower head and hand shower attachment, wash basin set within fitted cabinet, concealed cistern WC, heated towel rail, tiled splashback, extractor fan, tiles to floor, wall lights, obscure glass UPVC double glazed window to rear. Built-in wardrobe, UPVC double glazed window to rear with countryside views, radiator. Bathroom suite comprising bath with wall mounted shower over and shower screen, wash basin set within fitted cabinet, concealed cistern WC, tiled splashback, tiles to floor, heated towel rail, obscure glass UPVC double glazed window to front, wall lights. Front garden accessed via five bar gate, laid to low maintenance shingle with ample parking for numerous vehicles, shrubs and plants to raised flower beds, established Maple tree to front, wooden fence to perimeter, gated access to rear garden. Delightful well maintained rear garden, laid to lawn, paved patio seating area, selection of shrubs, flowers and plants to beds and borders, useful brick built shed/workshop with UPVC double glazed windows to front and rear and UPVC double glazed entrance door, enclosed garden backing onto farmland, wooden fence to perimeter, gated access to front.